If you like snorkelling, you'll just love Power Diving! With Power Dive's free-floating Power Snorkel Hookah, you can buddy dive to 6 metres with family and friends for more than an hour on the 35 a/h battery. There are no tanks to carry, wear or refill and, after your dive, simply recharge or exchange the battery and do it all again! 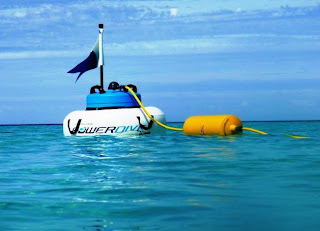 In the Power Snorkel Hookah, the pump and motor are housed in a floating surround which enables the Power Snorkel to float above with the divers below. With the Power Snorkel you can dive from the shore or your vessel. The Power Snorkel is fantastic in any resort style diving operation. Just the sheer appearance and concept of Power Dive attracts people to the product. It's bright appearance and dive flag, makes it easy to see where the divers are at all time. Training is minimal and inexperienced divers can be diving in minutes.